Wow this week has been a week of surprises! Things have been pretty darn difficult this last year. I try not to whine too much. To have all this happen consecutively elevated my spirits more than words can describe. I am so thankful for all my blogging and foodie friends! Monday I was graced with two loaves of bread, thanks to Foodbuzz and Natures Pride. I received Nature’s Prides newest duo; twelve grain and whole wheat breads to sample and review. That really got me going. I started with a peanut butter and Nutella sandwich on whole wheat. Nature’s Pride has created a wheat bread that is just delicious! In fact, I like it so well; I had a second sandwich for lunch! Two thumbs up for the wheat bread! Nature’s Pride proudly proclaims these new breads to be all natural and “heart healthy”. In keeping with their proclamation and my foodie cravings, I prepared Oven Baked Chicken Milanese Sandwiches on twelve grain bread for dinner. 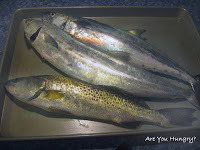 Tuesday, hubby returned late in the day with two mackerel and sea trout fresh from the Gulf. It has been a very long time since he dropped a line into the water, so this really made his day too! Wednesday, Rondi, author of WAHM Resource Site, awarded my blog with the best blog award. I am flattered, thank you Rondi! Check out Rondi’s site as she has a wealth of information for you Work At Home Moms. Wanda authors Only Cookware Blog, There you will find recipes, cookware reviews and tips, and of course the blog of the week. Be sure to check Wanda out. Congrats, you are having a great week, you deserve it! You go girl! Enjoy! Maybe your year is changing with the weather. Cool, sounds like you had a killer week. And keep eating the whole wheat bread! What a week! Hope i will soon experience the same thing..
Congrats on being featured! That is great! I hope you have another wonderful week! I think this is a recipe I've been looking for. I ate creamy chicken and rice soup at a restaurant a couple of weeks ago. It was so good and since they make so much I couldn't get the recipe. I believe this will help me duplicate their recipe.